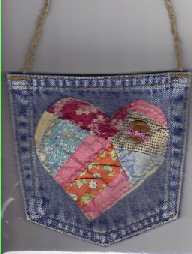 Sew some recycle crafts fun with a jeans pocket purse for your kids or grand kids. This is easy fun, and the biggest job is taking the pockets off the jeans. We use a seam ripper, but this needs to be done with care. This is so easy and fun, you will want to make more than one, and you can decorate it with whatever you think a little girl would like. If you crochet, you may want to crochet the strap. You can also use three strands of ribbon or twine and braid the strap. Use your imagination, and make this easy and fun jeans pocket purse for someone you love. Make it fun, and see you soon! Foundation piecing is a quilting technique you can learn quickly, and use it for many different sewing crafts projects. The purpose of foundation piecing is to give support and a framework to the project, and it works great for small pieces or something you would want a lining fabric for--like a crazy quilt. We have been working on a crazy quilt made with specific shapes for each square, not the usual crazy quilt with a pentagon in the center. Almost all crazy quilting lends itself to foundation piecing. Foundation piecing begins with a foundation or background of muslin or even paper, since this was originally paper piecing done with newspapers. We prefer to work with muslin or similar fabric and leave the foundation on for backing fabric. We mark the design on the foundation, then sew a piece in place just flat on the foundation. Add the next piece by lining it up against the edge of the first one, flip it over and stitch with right sides together with the first one. Flip it back and add the next piece to it. 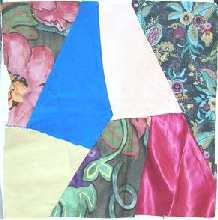 Once you see how it is done, you can see other crafts and crafting uses for foundation piecing. Get the new year off to a good start by learning a new technique for your crafts projects, or getting a new needlework project started. It is a perfect time--while the weather is limiting outdoor activity. Silk ribbon embroidery roses are one of the fun flowers to make in silk ribbon. 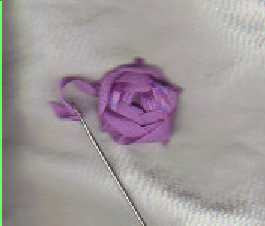 Some of the roses can also be made in thread embroidery, like the spiderweb rose shown at the left here. The spiderweb rose is one of the prettiest ribbon embroidery roses, and is an easy one to make. Make five spokes from a center like a bicycle wheel, then alternate over and under with your ribbon from the center working out to the edge. Try it with embroidery floss. It is smooth and silky looking, completely different from the ribbon, and exactly the same process. Ribbon embroidery is a fun crafts project, and roses are the center of lots of the ribbon crafts. Learn to make the roses in different styles, and the ribbon embroidery projects will go fast. Have fun learning ribbon embroidery roses. Ribbon embroidery is unique embroidery that can be done on fleece or felt fabric as well as moire and cotton. It is best worked with silk ribbon because the silk has more flexibility than polyester or similar ribbon. If you already do thread embroidery, ribbon embroidery has a few of the same stitches, but projects can be completed faster in ribbon than in thread. This is a fun needlework crafts project that brings out the artistry and allows for personal style. This violet is made with the ribbon stitch and a couched ribbon stitch, and these instructions can be used for a lady slipper or other flowers that have two petals up and three down. Start needlework crafting for the new year, and learn silk ribbon embroidery as a new craft. 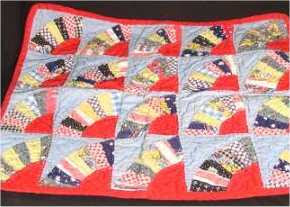 Doll quilts or quilting miniatures are great projects for adults and young children. This quilt is one I made when I was eight years old, so do not underrate the ability of a young child. A doll quilt or miniature usually has quilt blocks that are about 3 1/2 inches square, and although this one is more detailed than I would probably suggest for a child to make, almost any quilt pattern can become a miniature quilting project. One of the great advantages to making a miniature doll quilt is that you will probably not need any batting, since dolly promises she won't get cold. Start a new project while the weather is cold. Frame a miniature quilt or use it for dolly, or give it to your favorite child. All are worthwhile. 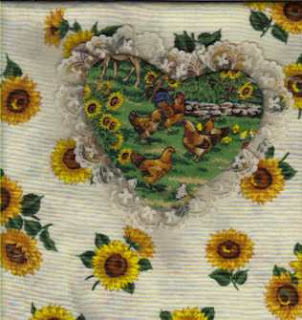 Applique with hand sewing often seems tedious and using the blanket or buttonhole stitch makes the work look a little like folk art. If you want to make a pillow with an applique that is done on the sewing machine, this is the method that works best for us. Make the applique separate from the pillow by making it double. Use any thin scrap fabric for the back, or use the same fabric as the front. You can even add lace or embellish the edge before applying the applique to the front of the cut-out pillow. Of course you can make appliques like this and use them for clothing or other crafts, not just for pillows. Once you see how easy this is, you will think of lots of practical uses for making an applique with the sewing machine this way. Start the new year with learning new techniques and fun for needlework crafts. We always have a few more in the works.